The registration to this conference is now closed! Thank you for visiting! Check out my homeschool resources here! Homeschooling is one of the most challenging, and at the same time, rewarding experiences of my life aside from becoming a parent. To add – choosing to homeschool following Montessori method also turned out to be one of the lonely paths to go. 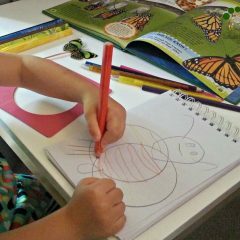 In Australia particularly, Montessori name and method are still surrounded by plenty of myths and misconceptions. The most positive comment I personally heard from a parent who doesn’t do Montessori is “Oh, isn’t it where Google guys went to school? !” Yes, these are truly inspiring examples of outcomes that Montessori method can bring, you learn to think outside the box and solve problems successfully. But there is so much more that hides behind it – there is greater value in ideas that create an atmosphere of respect and add value to child’s personal unique abilities; cultivate inner discipline and build strong bond with the outside world without losing oneself. This is our motivation behind stepping into the waters of the Montessori world – so deep and often, unknown. There is the abundance of knowledge that leads us to desire to continue pressing into the depth of Montessori method and look into the very core of it. Early at the beginning of the new year, every Montessori homeschooling teacher will have a unique opportunity to join Online Montessori event organised for homeschooling families by Seemi Abdullah – the founder and director of Trillium Montessori. This is a chance to connect with other like-minded home educators from all over the world, hear their stories, and get inspired. We probably all heard “the theory”. We know that Montessori is totally amazing – so beneficial for the child. Now it’s time to learn and get motivated to apply it in practice. This is what this online homeschool conference is about – Practical Montessori Homeschooling. We often see the end result without really knowing what goes behind it, sometimes we see the finished product – polished, beautiful, perfect. But we want to know how to get there. What happens in the “messy workshop”, all the materials and tools that’s been put into practice, the attitude, the bruises, the sleepless nights and the happy moments. 14 expert speakers, the total value of Summit is $420. Trillium Montessori expert workshops are $30 each. For this summit, you can get all 14 workshops for only $69. You can choose to listen to all 14 tracks or you can only enroll in one out of three track levels: Primary Level Track, Elementary Level Track, or Specials Track. In saying that, each level will also allow you access to four Foundations For Your Montessori Homeschooling Journey presentations. I felt very humbled and grateful for the chance to be a part of this one-of-a-kind event and be presenting among some of the most accomplished, dedicated and passionate Montessori professionals and homeschooling legends. Even though our homeschooling journey has a very short history – my oldest child is only 4, I have been working with children for 10+ years. In my presentation, I talk about my experience and understanding of the Montessori concept of Freedom within limits. There are other absolutely stellar homeschooling Montessorians who generously share their journey with us. There are best-selling authors, Montessori trainers, Montessori school owners, parent and teachers consultants. It is truly unique chance to hear them spread their wealth knowledge, passion, experience gathered throughout many years of putting Montessori ideas into practice in their own homes and at work. To hear ALL fourteen presentations you can enrol for a very modest price ($69) and listen to them in your own time! I have to add that after enrolling in previous Online Trillium Montessori Summit for Teachers, Parents and Administrators, I gained a whole new level of appreciation of the additional knowledge I received by listening to the presenters. It definitely shifted and refreshed my perspective of the Montessori method and gave a strong push towards becoming better parents for my kids. Thank you and please, take your time to consider if this is something you truly can benefit from at this stage of your homeschooling and parenting journey.